She’s the Manic Pixie Dream Girl of her time: free-spirited, impulsive, flighty and elusive. Highly sexual and empty-headed; often a mere plot device and simultaneously an object of scorn and lust. “The masculine gaze is attracted, not that the masculine throat may sigh, but that the masculine mouth may grin in amused derision,” wrote one Detroit critic, of that alluring figure, the flapper. 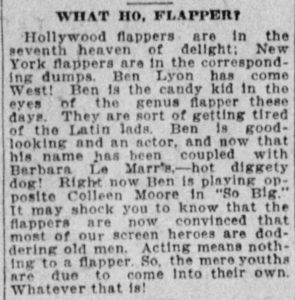 The subject of countless paeans and diatribes, the flapper continues to intrigue us all these years later. So where did she come from? The flapper was the product of a host of social and economic influences: women’s suffrage, World War I and its resultant globalization and modernization, and, of course, Prohibition itself. The etymology of the term is murky at best. It’s most likely a mix of origins: 17th century slang for prostitutes; the flapping of a young girl’s long braids; and a gangly young bird who leaves the nest before she’s entirely sophisticated enough to care for herself. However the term came about, by 1921 it was well established in the public vernacular. The flapper dominated popular culture. As the daughter of the suffragettes who fought hard and bitterly for women’s rights, the young adults of 1920 were aware that they entered a brave new world. And such creatures they were! But despite all the hoopla about the flighty flapper, she was in fact much more than an empty-headed gal-about-town. The flapper was really just the most recent iteration of the “Modern Woman” that so preoccupied the pundits and the curmudgeons of the day. She wore alarmingly short skirts. She smoked and drank—on barstools—and she Rode in Cars with Boys. The dazzling speed at which the world was changing, brought on by the increased mobility of the automobile and the population shift from family farms to city apartments, meant that young women simply couldn’t court like their parents had, on front porches and at Sunday ice cream socials. The flapper has been characterized—to her detriment—by mostly male critics as flighty, shallow, and greedy. The reality is, the vast majority of these young women pouring into city society were one meal away from utter poverty. The middle class flapper worked at a telephone switchboard for a large company for 10 hours a day, or hunched over a stenography machine. She swapped pretty dresses with her girlfriends for a night on the town and borrowed lipstick and kohl eyeliner. With the rare exception of the ultra-rich, most flappers lived pretty dismal lives, and the freedom of the city life was a precarious and heady mix of excitement and dread. Dates—a new concept at the time—were fraught with tension and compromise. A Friday night with dinner and drinks paid for by a middle manager at her company was likely the only decent meal a struggling flapper had all week. But she had to negotiate exactly how much she was willing to offer in exchange for this night of excitement. Her dilemma: too little, and you don’t get asked out again and word gets out that you’re stingy. Too much, and you don’t get asked out again and word gets out that you’re a floozy that’s fun for one night out, but certainly not long-term, take-home-to-mother material. The revolutionary new bar stool looks both thrilling and precarious from the perspective of the ambitious young woman of the 1920s. We spend a lot of time lauding the Rosies of World War Two for stepping in and keeping the Arsenal of Democracy running while the boys were off fighting in the war. But you know what? Rosie learned how to do it from her mother, who worked in an auto plant or running communications during the first world war. The flapper, young, bright and willing to throw convention to the winds in order to get ahead in life, has her origins in World War One at least as much as in the juke joints and speaks of a few years later. Prohibition gave us a slew of cocktails we still drink today. It gave us the 18th, 19th (that little thing granting women the right to vote) and 21st amendments. It also gave us gangsters and NASCAR, but hey, nothing’s perfect. It also gave us a newfound respect for independent women looking for a fun night out on the town, who were shrewd enough to tally the transactional costs of a Last Word or a Bee’s Knees. 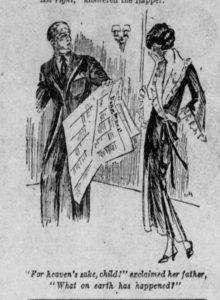 *The title of this post comes from a typical 1924 blurb in the Detroit Free Press, when young women were (according to newspapermen, of course) fangirling over the latest Hollywood Hunks.